Please note – when you purchase this miniature, you’ll receive the Start Collecting! 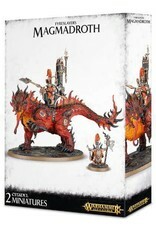 Fyreslayers box. 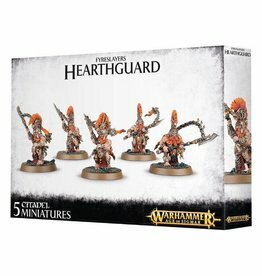 This contains the complete Magmadroth kit, with all the options as described here, as well 10 Vulkite Berzerkers, for the same price! The future of the Fyreslayer lodges needs to be secure, and the Auric Runesons are there to make sure of that. 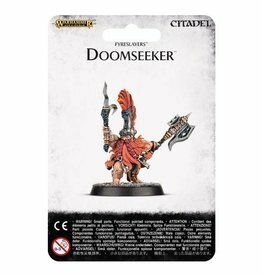 Each is a splendid warrior in his own right, eager to prove his worth to the lodge - they may one day become the successor to the Runefather, leading the lodge in glorious battle. Wielding devastating ancestral weapons, they hunt out and destroy the most powerful foes to slay in the name of Grimnir; the Magmadroths they ride certainly aid in this task, with their lethal, whipping tails and super-heated breath. Fyreslayer vaults heave with the trophies collected by Auric Runesons, and their thirst for ur-gold is prodigious. This multi-part plastic kit contains all the components you need in order to assemble an Auric Runeson on Magmadroth. Armed with either an ancestral waraxe or a clutch of wyrmslayer javelins, he also carries fyresteel throwing axes. His skin is adorned with ur-gold runes hammered into his skin, and his helm and beard are mighty indeed! The Magmadroth features flame-shaped scales, three crest options, a huge flaming chimney on the saddle and a huge array of additional components - pipes, bundles of axes, a drinking horn and bundles of ancestral jewelry. 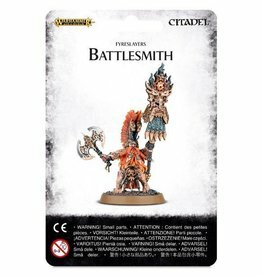 You can also assemble an Auric Runefather and Auric Runesmiter to accompany the Runeson on foot! Ninety-five components, one Citadel 120mmx92mm Oval base and two Citadel 32mm Round bases are included. 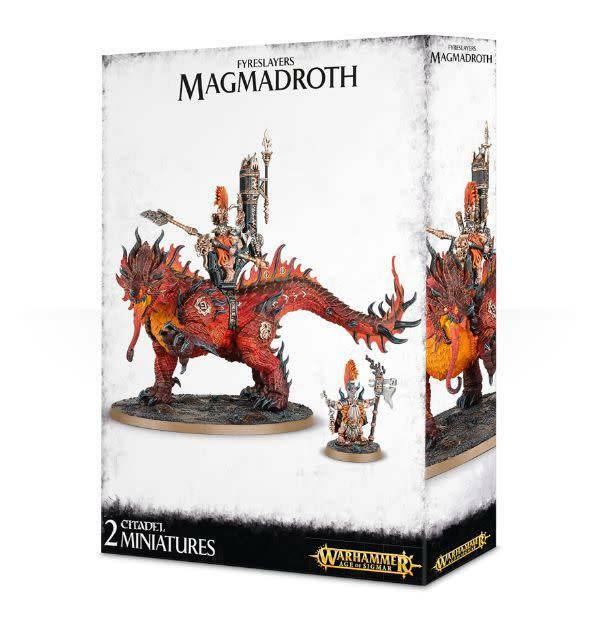 This kit can optionally be used to assemble the Auric Runefather on Magmadroth, or the Auric Runesmiter on Magmadroth.